Completion Level: Initial Scenario Finished, 50+ Hours. Pokémon meets SRPG? When Worlds Collide! Pokémon Conquest was conceived when the respective heads of Nintendo’s Pokémon franchise and Tecmo Koei’s popular Japanese Nobunaga’s Ambition franchise decided to fashion their mutual respect into a crossover game. Play What You Like will focus on the result, encountered by a non-Japanese with no knowledge of the Nobunaga’s Ambition franchise. But we do know SRPGs. We enjoy the Pokémon franchise mainly through the early seasons of the show, and the combat system design in general. We enjoyed the combat oriented games like Pokémon Stadium, but the regular games, with their grinding and never-ending random encounters, were not our speed. So when Pokémon got fitted for the SRPG genre, we were pleased. The execution is not perfect, but we’ll take a quality, fun crossover attempt like this any time over none. And fun it is. Without expectations regarding Nobunaga’s Ambition, the feudal Japanese setting is a pleasant change-up. The warlords of that franchise are unfamiliar and may distract initially. But they probably only add to those familiar with Nobunaga’s Ambition. Surely Pokémon Conquest encountered design challenges, likely amplified by the melding of two popular franchises, and heightened expectations. No one’s expectations are going to be fully realized in a compromising crossover title by its very nature. The layout begins with a detailed and active world map. Cities host grid-based fighting areas of all sorts, realized in full 3D, and rotatable at set 45 degree increments. Generally speaking, you will pick a team of up to six Pokémon/trainer pairs to battle AI Warlords or another person in multiplayer. Pokémon cannot be used without their warlords, who each have their own strengths and affinities for various Pokémon types (like grass, flying, etc.). Got to Develop Them All: There are like a zillion Pokémon. Conquest does well including a great many in a deeper way than typical Pokémon games. This is no easy feat considering the varying characteristics in Pokémon. There are different types (fire, water, etc. ), different grid square attack patterns, plus additional abilities and attributes. Let’s just say they cram a lot of information into a DS game. It doesn’t scrimp when it comes to the Pokémon. Recruiting is a key element in any Pokémon game. Conquest doesn’t let you throw Pokéballs, but does offer a skill and timing system. In a turn-based game, this is risky. (We almost stopped playing a classic RPG because it made us chase down some stupid rats real-time! Props to anybody who comments on which we’re referencing.) The timing element is challenging enough to prevent over-recruiting, fun enough to be satisfying, and difficulty-balanced just right so turn-based sensibilities are not offended. 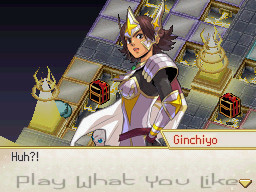 The game displays the strength rating of opponent groups before battle. It helps advancement through the story mode with less frustration. In encounters where only one enemy can be attacked, the game automatically sets up the aim. This sounds like a little thing, but times it by 1000 and you’ll quickly see its (time-saving) value. The game throws in these little comments from your warlords. They are an entertaining addition. A Little Something Extra: It’s true that, unlike other franchise games, Conquest gives each Pokémon only one attack. However this is ameliorated by each being given a secondary ability, and better still you can pay to change it. Most Pokémon have three abilities from which to choose out of a larger pool. Some are stat-increasing, like improving hit percentages. Some are defensive, like preventing critical hits. The ones we find especially fun are (low-percentage) abilities that put nearby opponents to sleep, or confuse, or temporarily paralyze them. One of the best things to happen to SRPGs is dynamically changing battle environments. This feature is epitomized in the Shining Force III (1998) train yard battle with cars that move every turn. They force one to adjust tactics and movement as new paths open and close. Ditches that flood (by a switch) and are then only passable by water type Pokémon. Paths that can be blocked by flame geysers and need to be attacked to be passed. Ice rafts that transport Pokémon down a river. Bridges that open and close. A machine-themed map that forces Pokémon onto giant cog hubs that rotate to open different paths. Environments also sport a few dynamic pieces. Trees can be destroyed to gain an item. On certain maps, otherwise nondescript grid squares actually house (really annoying) traps (not a good example to emulate). Boulders and logs can be pushed across a battlefield to damage opponents (this was surprisingly fun–and sometimes tragic). One map has teleporters. Perhaps the idea was good on paper, but we found it to be more of a nuisance. Just say “no” to teleporters. All these elements (in combination with terrain types) keep the environments from being static. Ash Has a Rival, Now You Can Too: Though setting up even multiplayer matches can be difficult (see “Ash Ketchum Versus the World” entry under Good and Bad), it’s one of the most fun and challenging aspects of the game. We spent more hours in multiplayer, or training different Pokémon to debut in multiplayer, than we did playing the story. Unusual battlefields from story mode, with their dynamic elements, also make for excellent (but occasionally frustrating) multiplayer battlefields. The XY generation female protagonist kicks it (semi) old school. Have it Your Way: Choosing a male or female protagonist fits the Pokémon franchise. But you’re also able to choose how your main Pokémon, an eevee, will evolve. It’s a rare Pokémon with multiple evolution choices. You like ice? Evolve eevee into glaceon. Fire? Flareon. Water? Vaporean. Dark? The cool-looking umbreon. And so on. 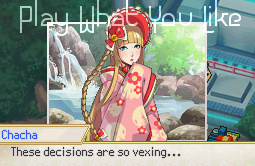 It’s not unlike choosing your class (job) in a game like Final Fantasy Tactics. It’s a good pillar about which to build this game. 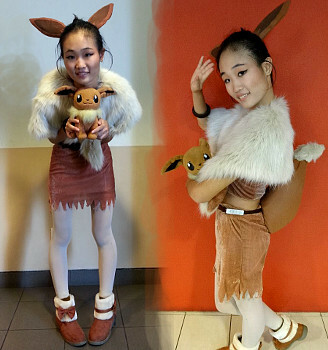 No matter HOW MUCH you like eevee, you have to evolve it to get far. Ahh, that’s more like it. Check out these glaceons. This ice Pokemon is favored by the game design. Elemental terrain like fire, water, or poison makes it easier, harder, or impossible for certain Pokémon to traverse. It’s a good way to add tactical variety to nearly flat terrain. The renderings of the Pokémon themselves are consistently good. They’re faithful and true and (mostly) interesting. Pokémon 2000 in 3D: All the playing fields are real 3D. However their design is a little lackluster and the rotation clunky. Additionally, finding Pokémon occluded by 3D geometry is more difficult than necessary since the blocking geometry doesn’t go translucent. The modern SRPG mindset expects translucency, but in this case it’s likely a hardware limitation. Still, we would rather have the 3D as is than not at all. 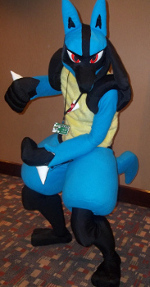 Attack Pattern Delta: The Pokémon employ a variety of attack patterns–referring to the combined shape and number of grid squares attacked at once. Sometimes it’s three grid squares straight out, or a rectangular shape made up of multiple squares, etc. It’s excellent for inducing tactical thinking, however some Pokémon get the short end of the Pokéball. These unfortunate creatures attack only one square directly in front of them, or one square a certain distance away. Unless these are a super-powerful attacks–and they pretty much aren’t–it’s imbalancing, relegating these poor Pokémon largely to the sidelines. A tale of two ghost types. Surprisingly, classic old school gengar ends up a better choice for us than this newb duskclops. The character art is high quality but inconsistent. It runs the gamut from very good, to okay, to goofy. Occasionally, you end up with opposing Pokémon immune to each other’s attacks. These rounds automatically end anti-climatically. Most battles (vs CPU) last 20 turns max. We can understand that as prevention against cheesy tactics, but we experienced longer battles where the pressure was not appreciated. “So you wanna to be a master of Pokémon…” This entry is about Pokémon type. Type match ups, electric versus water, water versus rock, rock versus grass, etc. Every new generation of Pokémon game seems to introduce a couple new types of Pokémon. Light, dark, fairy, etc. You don’t need to be a math whiz to know an ever greater number of match-up combinations are possible. If you care about the match-up pros and cons–and you need to for strategic play–you will probably end up looking at charts. Match-ups can be irksome, but add great depth to the game. However some pairings, beyond the basics, are not so intuitive. charts, ChARts, CHARTS! Everybody has a take! One Way or the Highway: Each Pokémon only has one attack (as mentioned above). It’s well implemented, but we’re talking about Pokémon, a franchise built upon creatures with four attacks. In light of Conquest’s depth, four is likely out of reach. But even two would go a long way to capture the classic feeling. Click the Paint Bucket to Fill in the Square: A score of very different tile sets produce even more 3D environments. It’s quite the elemental variety; from volcanic regions to icy lakes. From fertile green fields to rocky crags. The textures are decent, and some animate/color cycle textures for water, lava, etc. But more should be done to prevent visual boredom. A good tile set needs variety. Perhaps a procedural solution can be a remedy to boring textures. Maybe a moving, translucent layer of shadow mimicking clouds on a sunny day. Consider palette swapping the same textures to change day to dusk to night. Other procedural tricks like a rain, wind, or footprints can also liven things up. We interrupt this analysis to kick it original gen with Misty from the Pokemon TV series. Statisticians Like Stats: Both the warlords and the Pokémon have stats. For the latter, stats like attack, defense, range, and speed go with the territory. This doesn’t mean the stats are vital, because they aren’t. Of even less importance are the warlords’ attributes. Power, wisdom, charisma, etc… We aren’t rolling up pen and paper RPG characters with dice here. While the stats add depth to the game, their execution, necessity, and ease-of-use leave much to be desired. Don’t Be so Serious, It’s Just a Cartoon: A point we often emphasize is that death needs to matter in a SRPG, otherwise battles become pointless, sometimes boring exercises in which you have no investment. There’s no penalty for losing a Pokémon in battle (except perhaps not gaining some small amount of experience). But that’s the way Pokémon rolls. Did it help drama? No. Did it fit the franchise? Yes. That was Random: Certain items or events, quite important to the advancement of the story, gameplay, and pokémon evolution, are only available randomly. We’re all for fluidity and an emergent, unpredictable game world. But some crucial points need a controlled delivery. After all, it’s not too hard to end up on the wrong side of random. Book Smart but Poké-stupid: Certainly, use of online resources and FAQs can add dimension to a game. That’s the case for Pokémon Conquest–but perhaps too much so. There are codes to be looked up for rare Pokémon appearances, and Pokémon versus Pokémon charts to consult. The clincher that burns so much time is determining the best warlord/Pokémon matchups. Wandering the game aimlessly to find out this information (if even possible) would be no fun, but it isn’t much fun constantly referring to online charts either. Be prepared to take your own notes, and Notes… and NoTEs! Too big for a bullet point: Ash Ketchum Versus the World! For those with long experience in SRPGs, head-to-head play versus another person is a rare thrill. Pokémon Conquest’s wireless matches were something to which we were looking forward. But balancing such a system is key, and something we game developers ponder. How do you reward game experience yet still have an even match-up with someone who has played less? The matchmaking factor they come up with is “link percentage.” Some warlords can train, for example, an umbreon, all the way up to 100% of its potential, while others might only be able to take it up to 30%. Going into multiplayer, you can set a link percentage limit. Setting it to 60% brings down those higher. Those limited to a lower number still cannot rise to 60. The problems with this are manifold, especially if you only played the primary story and don’t have the right warlords for your favorite Pokémon. Some warlords can only be recruited in the post main-story quests (see entry “Two Halves…” under Bad). 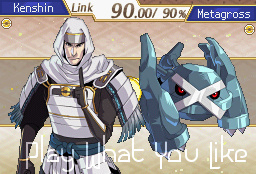 But say you do have the optimal warlord for the pokémon you want (a large assumption in this game), “link percentage” is still more a “battle strength suggestion.” Lower evolution Pokémon can almost never stand up to higher evolutions, which makes surface sense, but the franchise does star Ash and his Pikachu (retconned to a middle evolution from a starting type). This pikachu defeats higher evolutions routinely. In Conquest, some lower evolutions have fun abilities lost once they evolve. It’s too bad they can never really be brought into serious competition against higher evolutions regardless of link percentage or experience. Link percentage just did not equal fighting power in too many situations. Warlord OverPOpuLAtioN: A finite number of cities populate the map, and each holds only six warlords. Many recruiting opportunities appear as the game progresses. In fact, the hard part is knowing which warlords not to recruit early enough to prevent being overloaded. It’s easy to get too many. After that, much time is wasted juggling warlords from city to city, or constantly refusing their time-consuming offers to join while waiting for a particular one to ask. Pokémon Overload: Collecting pokémon, just because you can, soon overloads the system. (Similar to recruiting warlords.) You end up with bloated cities, and nowhere to put trainers and pokémon. The bloat manifests when trying to find a particular pokémon for multiplayer. Warlords usually have more than one pokémon assigned, but only the active one shows. Searching must be done with other sorting modes. Let the challenge be tactical, not finding pokémon in your roster. Do it for the “Joy” of Training Pokémon: …because there’s not much story to move you. Training pokémon is fun, but in an SRPG, one does expect more story. 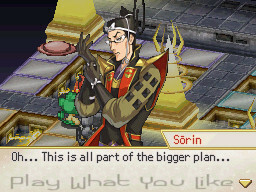 There’s the big baddie–Nobunaga (dubbed Nob-face by a player we know), who turns out not-so-bad. But aside from a few static lines of text, we really don’t know much about him for far too long. No conversations where the bad guy threatens you or something. No cut scenes—until much later. There’s just very little story motivation. Vanilla Ice: We’re fans of archers in classic, fantasy-based SRPGs. We also like the ice element when it comes to magic, or in this case, Pokémon type. The ice element includes a number of interesting pokémon, but aside from a couple of the game’s favorites (like Glaceon), they are a little nerfed. That means their effectiveness is, in our opinion, purposefully reduced. In this case it’s their hit percentage that was made too low. When a Pokémon hits, but not very hard, it’s a little frustrating. But when a Pokémon misses altogether, one is left more frustrated at the complete waste of a turn. It should be minimized. Olympic Heavyweight vs Middle School Featherweight: Pokémon match-ups, especially in multiplayer, are greatly influenced by type. Water is great against fire, electric is great against flying, etc. Some pokémon seem to have exceptional match-ups in more than their fair share of combinations. It results in one-sided encounters that are a frustrating detraction from the game. We’re talking normally very tough pokémon taken out in one, overpowered, ginormous, unnecessarily powerful hit. WE liked Haunter. This game, practically speaking, did not. Playing Favorites: It’s okay for players to have their favorite Pokémon, but when the game does it you either have to go with the flow, or pay the price. Pokémon Conquest has favorites. Of course we understand that eevee and all its evolutions are going to be good, after all they’re the centerpiece of the game. But there’s bias toward new Pokémon like chandelure. That thing attacks like 57 times in one round… Between this and the story problem (see below), the game fights against you playing your favorite Pokémon (unless it happens to be their favorite too). As Time Goes By: Each warlord can fight only once per month despite being able to carry multiple Pokémon. This probably prevents some gross unbalancing exploit. However, even going to a shop uses up a warlord’s action for that month. If you want to focus on certain warlords or pokémon, you might find yourself advancing the months a lot. But every advancement can take a sometimes annoying amount of time as the system displays each city following its given orders. There has to be a better way to get more done without advancing the month, or making the month advancement less onerous. How about both? Games are localized for reason, and it’s more than just making the language understandable. Sometimes certain concepts or culturally specific things are modified to be more acceptable or understandable to the new region. Strong ethnic names can be difficult to decipher for those whose ears are not tuned to them. If it’s a single character in passing, it doesn’t really make a difference. But it does become an issue, if for gameplay reasons, one must constantly pour through a long list of similar sounding, almost identically spelled names. 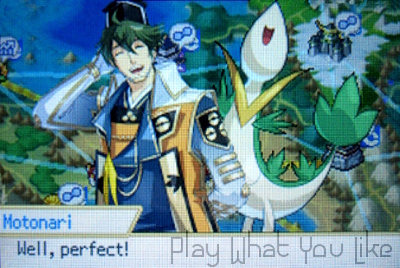 Pokémon Conquest uses warlord names from the Nobunaga’s Ambition series, and there are scores of them. Each has their own strengths with various Pokémon. Selecting among them and knowing their stats is a critical part of the game. A part made many times more onerous because of the naming. Take this short sampling: Kagekatsu Kanetsugu Katsuyori Kazumasu Masahide Masakage Masatoshi Masatoyo Masasuna Morichika Motochika Morikiyo Motoharu Motonari Motozane… Believe us, it goes on and on like this. I’m not feelin’ it lady. It’s like a game in itself! Probably our single biggest criticism of this otherwise quality offering is the decision to break the entire game into two unconnected parts. The first part is the “normal” SRPG story arc. You have to conquer the map, and along the way recruit pokémon and warlords. The problem is that many Pokémon are unavailable in this mode, along with many warlords necessary to bring them to 100% link percentage. At some point while playing the first part this becomes evident. For some, it may be after many hours of careful team building. So then you must determine whether to continue burning hours playing with your carefully constructed teams, or finish the initial part only to have all your work wiped out. That’s right, at the completion of the first part, after you beat Nob-face, all your pokémon and warlords are taken away and you pretty much have to start over. The second part is not like the first, either. It’s dozens of unrelated quests. Are they better than grinding? Yes. Do we want to play them after spending many hours building our teams and defeating Nob-face? No. It boils down to not playing with the pokémon you want, nor having the warlords you need. If you play Pokémon games, you undoubtedly have favorites. Imagine our elation at recruiting an onix, one of our favorites. 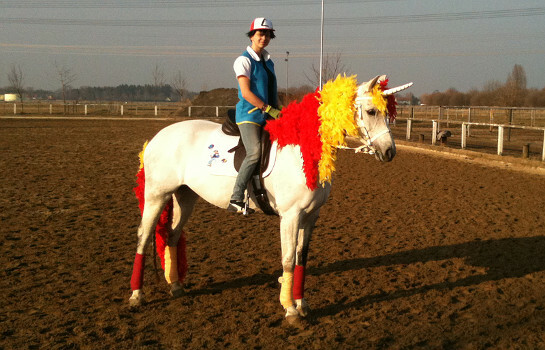 Imagine our disappointment at finding out he can only be taken up to 30% experience with the trainers at hand. Imagine looking forward to recruiting a blitzle, only to find it’s only available at some point in the second part quests. We at Play What You Like are big fans of Umbreon. Remember when Gary Oak and Ash had that showdown, Umbreon versus Picachu? They could have made one seriously awesome narrative with all the material scattered about in the second part if they combined it with the story arc of the first part. Instead we get an underwhelming story arc, and an underwhelming deluge of unrelated quests. We didn’t get to play with the Pokémon we wanted—despite their availability in the game, because we decided to stay with our initial investment of time, and not throw it away as the game tried to force upon us. Pokemon is a marketing juggernaut. Let not that last entry color our entire opinion of this otherwise fine game. There’s much to it, very much, and it succeeds at most. As for expectations, though easily raised, they should be guarded if you plan to play. This isn’t Ash Ketchum’s Crazy SRPG Adventure. If that were the case we surmise they’d have tried to more closely follow traditional pokémon paradigms. As with any Pokémon game, YOU have to decide how much research you’ll do. How much time you’re going to sink into the match-ups and/or the leveling. How far down the rabbit hole are you desirous of going? 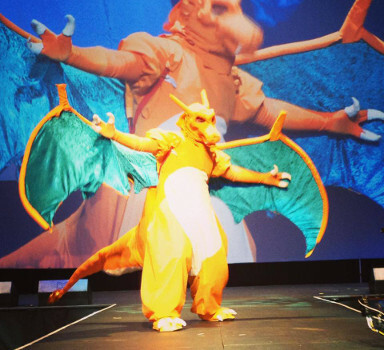 If you let it, Pokémon can become a second job (that doesn’t pay the bills…). If you want to play every possible quest in this game to its completion, it can last many, many hours. Not that all the quests offer fantastic, new gameplay avenues. They don’t. But if you have opportunity, try the head-to-head battle. That’s worth the effort. For some, Pokemon is a way of life. 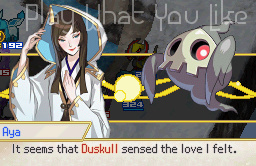 Is Pokémon Conquest fully satisfying to Nob-face’s Ambition devotees? Few in America can answer that question, but we think it probably gives it an amusing spin. Is it satisfying to Pokémon fans? We think so, especially for those who have played more than one standard Pokémon game and are looking for a change up with more game and less repetition. Is it satisfying to SRPG aficionados? Though it’s hard to separate out our appreciation for Pokémon, we think the SRPG aspects are strong enough to enjoy. Is it a super serious sword-and-magic political drama? No. (It’s got a positive ending!) Not every SRPG has to be as serious as Final Fantasy Tactics. Nor does one have to be clownish like Disgaea to be fun. Updated 06/28/15: Polished points and refined text. Holy crap man you’re alive! Nice write up, can’t wait to see more. Thanks Siveon. Oh, we are still here, and still have more analyses to post. Glad you liked this one. We went the extra grid square because Pokemon is such a popular franchise. 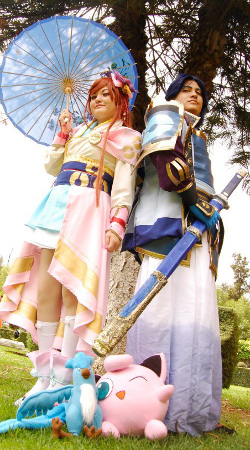 Also, quite frankly, because it had so much fun cosplay to choose from as well. This was definitely a spot-on review of the Conquest game. And yes, the cosplay is always fun (or funny). I really enjoyed this game, especially after I learned my way through the % compatibilities of my recruits and their Pokemon. I wish I had known that going in so I could have had a more compatible Lapras. 😦 But since I was never able to have an Eeevee evolve in any other Pokemon game, I went to town evolving my Eevees and finally got a Vaporeon for the first time. I was elated, and I was not displeased by how awesome it was in battle. 😉 I would also have to agree with you that the game should not have been split into separate halves. I would have played the second half had I got to keep all of the Pokemon I worked so hard for, but the game designers were going a whole different route. No matter what, it was all worth the game play in the end. Good to hear from you Nanobitz. Lapras was cool——with ice beams! We like ice, and do wonder why they made that story delineation. It was too much content tacked on after the story was done. Not the way SRPGs roll. So you liked vaporean? It was indeed strong in this game, hitting three squares in a row, straight out forward. And while flareon may look cool in this picture… with a steampunk trainer? Well, anyway, flareon only hit one square immediately in front of it. Not so “hot.” Thanks for stopping by.